The nonreceptor kinase Janus kinase 2 (JAK2) has garnered attention as a promising therapeutic target for the treatment of CKD. However, being ubiquitously expressed in the adult, JAK2 is also likely to be necessary for normal organ function. Here, we investigated the phenotypic effects of JAK2 deficiency. Mice in which JAK2 had been deleted from podocytes exhibited an elevation in urine albumin excretion that was accompanied by increased podocyte autophagosome fractional volume and p62 aggregation, which are indicative of impaired autophagy completion. 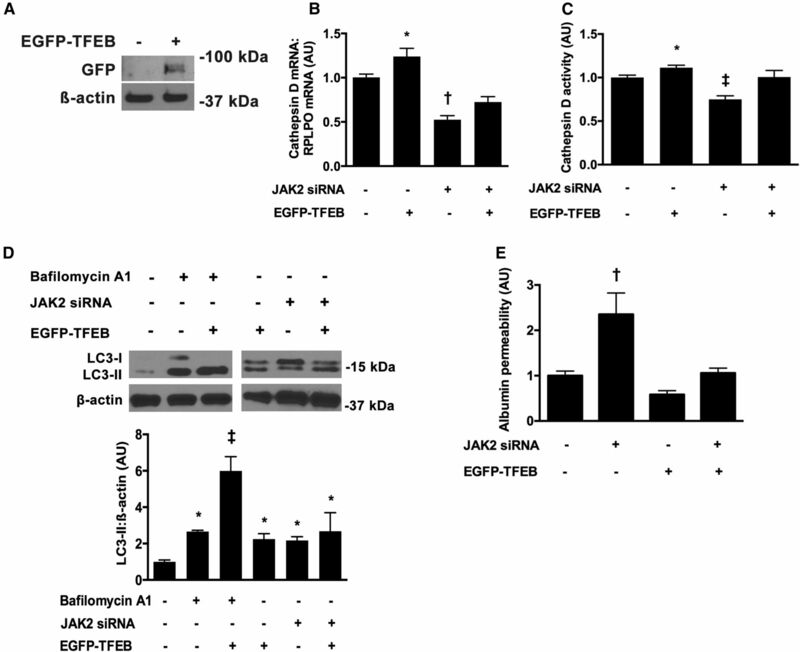 In cultured podocytes, knockdown of JAK2 similarly impaired autophagy and led to downregulation in the expression of lysosomal genes and decreased activity of the lysosomal enzyme, cathepsin D. Because transcription factor EB (TFEB) has recently emerged as a master regulator of autophagosome-lysosome function, controlling the expression of several of the genes downregulated by JAK2 knockdown, we questioned whether TFEB is regulated by JAK2. In immortalized mouse podocytes, JAK2 knockdown decreased TFEB promoter activity, expression, and nuclear localization. In silico analysis and chromatin immunoprecipitation assays revealed that the downstream mediator of JAK2 signaling STAT1 binds to the TFEB promoter. Finally, overexpression of TFEB in JAK2-deficient podocytes reversed lysosomal dysfunction and restored albumin permselectivity. Collectively, these observations highlight the homeostatic actions of JAK2 in podocytes and the importance of TFEB to autophagosome-lysosome function in these cells. These results also raise the possibility that therapeutically modulating TFEB activity may improve podocyte health in glomerular disease. 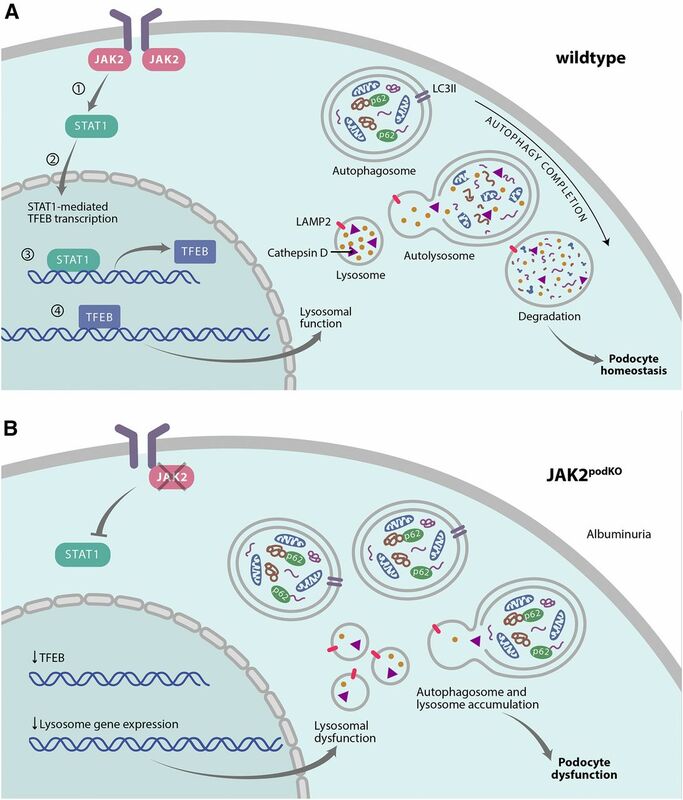 Cognizant of the growing interest in therapeutic applications that alter JAK/STAT signaling in kidney disease and the dearth of literature espousing the homeostatic actions of the pathway in podocytes, we set out to examine the phenotypic effects of JAK2 absence. To our surprise, we found that JAK2 deficiency in mice led to an impairment in autophagy in podocytes, and in exploring the means by which this occurred, we identified a hitherto unrecognized action of JAK2 in controlling the expression of the master regulator of autophagy15 and lysosome function,16 transcription factor EB (TFEB). To examine the normal actions of JAK2-dependent signaling in podocytes, we generated podocyte-specific JAK2 knockout mice. First, to confirm that Cre recombinase expression was limited to the glomerulus, we bred Podocin-cre+ mice17 with ROSA26 reporter mice (R26Rfl/fl).18 Histologic staining of kidney sections from Podocin-cre− mice showed no expression of β-galactosidase, whereas β-galactosidase was strongly expressed in the kidneys of Podocin-cre+R26Rfl/fl mice, where it was constrained to the glomeruli (Figure 1A). To examine whether the presence of the cre transgene affects podocyte permselectivity, we followed Podocin-cre− and Podocin-cre+ mice for 6 months, observing no difference in the rate of urinary albumin excretion between the two groups (Supplemental Figure 1). Second, to generate podocyte-specific JAK2 knockout animals, we bred Podocin-cre+ mice with Jak2fl/fl mice in which loxP sites had been placed around the promoter and first coding exon of Jak2.19 We studied two groups of mice: Podocin-cre+Jak2+/+ mice and Podocin-cre+Jak2fl/fl mice, henceforth referred to as JAK2Ctrl and JAK2podKO, respectively. Both groups of mice were born in the expected Mendelian frequency. To determine the efficiency of JAK2 deletion, we isolated primary cultured podocytes from JAK2Ctrl and JAK2podKO mice. Primary cultured podocytes were recognizable by their arborized morphology and the expression of the podocyte protein nephrin on immunoblotting (Figure 1B). JAK2 deletion from podocytes in JAK2podKO mice was confirmed by (1) immunoblotting (Figure 1C) and (2) immunofluorescence microscopy (Figure 1D). JAK2 deletion impairs podocyte autophagy completion in vivo. (A) Enzymatic X-gal staining of kidney sections from a Podocin-cre− mouse and a Podocin-cre+R26Rfl/fl mouse showing glomerular β-galactosidase expression in the Podocin-cre+R26Rfl/fl mouse. Original magnification, ×400. (B) Phase-contrast microscopy (original magnification, ×100) and immunoblotting for nephrin in primary cultured mouse podocytes. Lysates from 3T3 cells are provided as a comparator. (C) Immunoblotting for JAK2 in lysates of primary podocytes isolated from JAK2Ctrl and JAK2podKO mice. (D) Immunofluorescence dual staining for nephrin and JAK2 in glomerular sections from JAK2Ctrl and JAK2podKO mice. The merged image shows colocalization of JAK2 and nephrin (yellow-orange color) in JAK2Ctrl but not in JAK2podKO. Blue is 4',6-diamidino-2-phenylindole (DAPI). (E) Urine albumin excretion in JAK2Ctrl and JAK2podKO mice ages 10 weeks old and 6 months old. (F) Transmission electron micrographs of podocytes from JAK2Ctrl and JAK2podKO mice and autophagosome volume fraction. The transmission electron micrographs illustrate autophagosomes (thick black arrows) and lysosomes (thin black arrows) in the podocyte from the JAK2podKO mouse. Insets are a higher magnification. Original magnification, ×25,000. (G) Immunoblotting primary cultured podocytes from JAK2Ctrl and JAK2podKO mice for LC3. (H) Immunofluorescence dual staining for nephrin and p62 in glomerular sections of JAK2Ctrl and JAK2podKO mice. Insets represent zoomed-in images of the dashed areas. The white arrows point to p62 puncta in podocytes (nephrin positive) from the JAK2podKO mouse. (I) Immunoblotting primary cultured podocytes from JAK2Ctrl and JAK2podKO mice for p62. (J) Immunofluorescence staining for nephrin and LAMP2 in glomerular sections of JAK2Ctrl and JAK2podKO mice. (K) Immunoblotting primary cultured podocytes from JAK2Ctrl and JAK2podKO mice for LAMP2. AU, arbitrary units. *P<0.05; †P<0.01. In adult mice (age 10 weeks old), the magnitude of urine albumin excretion in JAK2podKO mice was almost double that of their littermate controls (Figure 1E, Supplemental Table 1). Albuminuria in Podocin-cre+Jak2fl/+ heterozygous mice fell midway between the levels seen in JAK2Ctrl and JAK2podKO mice (urine albumin excretion, 22±4 μg/d; n=13). By 6 months of age, urine albumin excretion was increased threefold in JAK2podKO mice (Figure 1E). In subsequent experiments, we focused our analyses on the structural changes that occurred in mice at the earlier (10 weeks) time point, which we speculated were more likely to be causatively implicated in the development of albuminuria. At this stage, glomerular morphology in JAK2podKO mice was unremarkable when assessed by light microscopy (Supplemental Figure 2). In contrast, when we examined the ultrastructure of podocytes by transmission electron microscopy, we observed an approximately 80% increase in autophagosome fractional volume in JAK2podKO mice (Figure 1F). Similarly, in primary podocytes from JAK2podKO mice, there was an increase in abundance of LC3-II, the autophagosome-associated phosphatidylethanolamine-conjugated form of the protein microtubule-associated protein 1A/1B–light chain 3 (LC3)20 (Figure 1G). We considered that increased autophagosome fractional volume and LC3-II levels could be due to either enhanced induction of autophagy or impaired completion of autophagy. To help us distinguish between these two scenarios, we probed for the autophagy substrate, p62 (also called sequestosome 1), that accumulates in the cytosol when autophagy is impaired.21 In comparison with JAK2Ctrl mice and suggestive of impaired autophagy completion, there was an increase in podocyte p62 in JAK2podKO mice (Figure 1, H and I). This impairment in autophagy completion was accompanied by an increase in lysosome accumulation as assessed by immunostaining and immunoblotting for the lysosome marker lysosome-associated membrane protein 2 (LAMP2) (Figure 1, J and K). To better understand the causes of autophagosome-lysosome accumulation in JAK2-deficient podocytes, we turned to an immortalized cell culture system and transfected conditionally immortalized differentiated mouse podocytes22 with either sequence-specific short interference RNA (siRNA) directed against JAK2 or scramble control (Figure 2A). Immunoblotting cell lysates revealed that JAK2 knockdown in these cells similarly led to an increase in the abundance of LC3-II and p62 (Figure 2B), suggestive of impaired autophagy completion. The increase in LC3-II after JAK2 knockdown was comparable with that observed when autophagic flux was blocked with Earle's Balanced Salt Solution (EBSS; autophagy induction) and bafilomycin A1 (an inhibitor of autophagy completion), with no additive effect of the combination of JAK2 siRNA, EBSS, and bafilomycin A1 (Figure 2C). In contrast, LC3-I levels appeared lower in podocytes exposed to EBSS and bafilomycin A1 in the presence or absence of JAK2 siRNA, likely indicative of autophagy induction with the former conditions that was unaffected by JAK2 knockdown (Figure 2C). Stereometric evaluation of transmission electron micrographs revealed an increase in autophagosome and lysosome volume fraction in JAK2 siRNA-transfected podocytes compared with scramble-transfected cells (Figure 2D). Likewise, LAMP2 expression was increased in the setting of JAK2 knockdown when assessed by either immunoblotting (Figure 2E) or immunostaining (Figure 2F). JAK2 knockdown with siRNA causes autophagosome and lysosome accumulation in cultured immortalized mouse podocytes. (A) JAK2 knockdown with siRNA. (B) Immunoblotting for LC3 and p62. (C) Immunoblotting for LC3 in JAK2 siRNA-transfected podocytes (or scramble-transfected cells) incubated in EBSS for 19 hours (5 hours post-transfection), with bafilomycin A1 (100 nM) added for the final 4 hours. (D) Transmission electron micrographs of mouse podocytes transfected with scramble or JAK2 siRNA and autophagosome and lysosome volume fraction. Insets are higher magnification (original magnification, ×25,000). The thick arrow labels an autophagosome, and the thin arrow labels a lysosome. (E) Immunoblotting for LAMP2. (F) Immunofluorescence staining for LAMP2 (red) and 4',6-diamidino-2-phenylindole (DAPI) (blue). GAPDH, glyceraldehyde 3-phosphate dehydrogenase; AU, arbitrary units. *P<0.05 versus scramble; †P<0.01 versus scramble. Although the regulation of autophagic processes can differ between primary cells and cell lines23 and although the primary culture was an enriched but not pure podocyte cell population (>85% nephrin positive) (Supplemental Figure 3), JAK2 knockout/knockdown consistently impaired late-phase autophagy. We speculated that this impairment could be due to either improper fusion of autophagosomes with lysosomes or impairment of lysosome function itself. Because the JAK/STAT pathway is a major regulator of gene transcription, we focused our next discovery experiments on mRNA changes of genes linked to autophagy pathways in podocytes transfected with JAK2 siRNA. To explore the regulation of autophagosome-lysosome fusion, we reviewed the biomedical literature and compiled a list of 16 genes previously linked to this process. Using RT-qPCR, we found little change in the expression of any of these genes with JAK2 knockdown (Supplemental Table 2). A difference in mRNA levels encoding four proteins achieved statistical significance (histone deacetylase 6, Huntingtin-associated protein 1, sorting nexin 14, and vesicle-associated membrane protein 8). However, whereas each was increased in its expression, none were upregulated >1.25-fold (Supplemental Table 2). In the context of minimal change in expression of genes involved in autophagosome-lysosome fusion, we hypothesized that the impairment in autophagy completion in JAK2-deficient podocytes was a consequence of lysosome dysfunction. 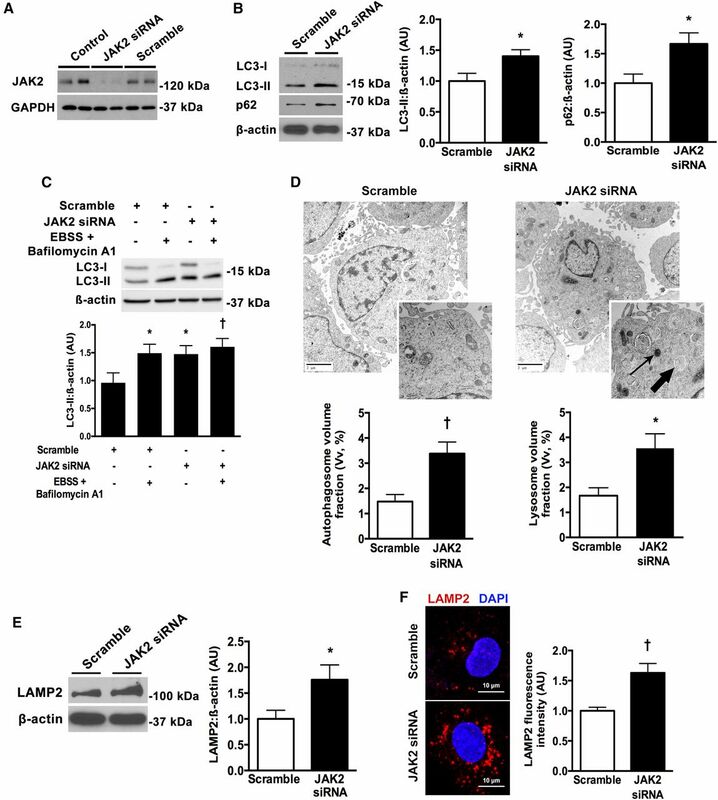 Consistent with the presence of lysosome dysfunction, JAK2 knockdown caused a decrease in the activity of cathepsin D (Figure 3A), a lysosomal aspartic proteinase, the deficiency of which was recently implicated in impaired podocyte autophagy.24 Because the transcription factor TFEB has been linked to lysosome function,16 autophagy,15 and cathepsin D activity,25 we performed a second RT-qPCR–based screen for mRNA changes of 13 genes drawn from a list of the most likely lysosomal direct targets of TFEB.26 Six of the 13 likely TFEB targets were significantly downregulated with JAK2 siRNA (including cathepsin D) (Table 1). Of these six transcripts, five were also downregulated in podocytes from JAK2podKO mice, with statistically significant reductions seen in mRNA levels of beclin-1, cathepsin D, and cystinosin (Figure 3B). JAK2 knockdown or knockout impairs lysosome function and decreases TFEB expression in mouse podocytes. (A) Cathepsin D activity in immortalized podocytes transfected with scramble or JAK2 siRNA for 24 hours. (B) Relative mRNA levels of TFEB targets in primary podocytes from JAK2Ctrl and JAK2podKO mice. BECN1, beclin 1; CTSD, cathepsin D; CTNS, cystinosin; MCOLN1, mucopilin-1; RRGAC, Ras-related GTP binding C; STK4, serine/threonine kinase 4. (C–G) Regulation of TFEB expression by JAK2 in immortalized podocytes transfected with scramble or JAK2 siRNA for 24 hours. (C) TFEB promoter activity. (D) TFEB mRNA levels. (E) TFEB protein levels. (F) TFEB nuclear levels. (G) Chromatin immunoprecipitation of the TFEB promoter after STAT1 enrichment. (H) TFEB protein levels in primary podocytes from JAK2Ctrl and JAK2podKO mice. AU, arbitrary units. *P<0.05 versus scramble; †P<0.05 versus JAK2Ctrl; ‡P<0.01 versus scramble; §P<0.01 versus IgG. Having discovered a downregulation in the expression of several putatively TFEB-regulated genes with JAK2 knockout or knockdown, we queried whether TFEB itself is affected by JAK2 knockdown. Supportive of this assertion, TFEB promoter activity (Figure 3C), mRNA levels (Figure 3D), protein levels (Figure 3E), and nuclear localization (Figure 3F) were each reduced in mouse podocytes transfected with JAK2 siRNA compared with scramble-transfected cells. In determining how JAK2 may regulate the expression of TFEB, we performed in silico analysis of the mouse TFEB promoter and identified six putative binding sites for the JAK2-dependent transcription factor, STAT1 (Supplemental Figure 4). By chromatin immunoprecipitation, we found that STAT1 was enriched at the TFEB promoter and that its enrichment was negated with JAK2 siRNA (Figure 3G). We immunoblotted podocytes isolated from JAK2podKO mice, and in doing this, we also observed a reduction in TFEB expression with JAK2 knockout (Figure 3H). In our final series of experiments, we investigated whether the podocyte dysfunction, induced by JAK2 knockdown, could be reversed by TFEB overexpression. We transfected cells with a plasmid encoding EGFP-tagged TFEB27 (Figure 4A) that negated both the downregulation in cathepsin D gene expression (Figure 4B) and the reduction in cathepsin D activity (Figure 4C) with JAK2 siRNA. By immunoblotting, we observed an increase in LC3-II with TFEB overexpression and an augmentation in this increase with the inhibitor of late-phase autophagy bafilomycin A1 (Figure 4D), indicative of increased autophagic flux with TFEB overexpression that was blocked by bafilomycin A1. Unlike bafilomycin A1, however, JAK2 siRNA did not augment the increase in LC3-II with TFEB overexpression (Figure 4D), suggesting that JAK2 is upstream of TFEB in autophagy regulation. Lastly, to assess whether the enhancement of autophagic flux with TFEB overexpression improved podocyte function, we assessed the passage of fluorescently labeled albumin across podocyte monolayers. Whereas JAK2 knockdown increased albumin transport across monolayers, this increase was negated by TFEB overexpression (Figure 4E). TFEB overexpression restores lysosome function and albumin permselectivity in JAK2-deficient mouse podocytes. (A) Immunoblotting for GFP in control mouse podocytes or podocytes transfected with EGFP-tagged TFEB. (B) Cathepsin D mRNA levels under control conditions (scramble) or transfected with JAK2 siRNA, EGFP-tagged TFEB, or JAK2 siRNA and EGFP-tagged TFEB. (C) Cathepsin D activity in podocytes under control conditions (scramble) or transfected with JAK2 siRNA, EGFP-tagged TFEB, or JAK2 siRNA and EGFP-tagged TFEB. (D) Immunoblotting for LC3 in podocytes transfected with EGFP-tagged TFEB in the presence or absence of 100 nM bafilomycin A1 for 4 hours or JAK2 siRNA for 24 hours. (E) Albumin permeability in podocytes under control conditions (scramble) or transfected with JAK2 siRNA, EGFP-tagged TFEB, or JAK2 siRNA and EGFP-tagged TFEB. EGFP, enhanced green fluorescent protein; GFP, green fluorescent protein; RPLPO, large ribosomal protein; AU, arbitrary units. *P<0.05 versus control; †P<0.05 versus all other groups; ‡P<0.001 versus all other groups. The autophagy-lysosome pathway is a highly regulated and evolutionarily conserved catabolic process that enables cells to remove and recycle intracytoplasmic material during times of stress or starvation. It seems to be particularly important to the maintenance of the health of nonmitotic cells, such as the neurons of the central nervous system28 and the podocytes of the renal glomerulus.1 Here, we found that genetic removal of the kinase JAK2 impairs autophagy completion and podocyte function. 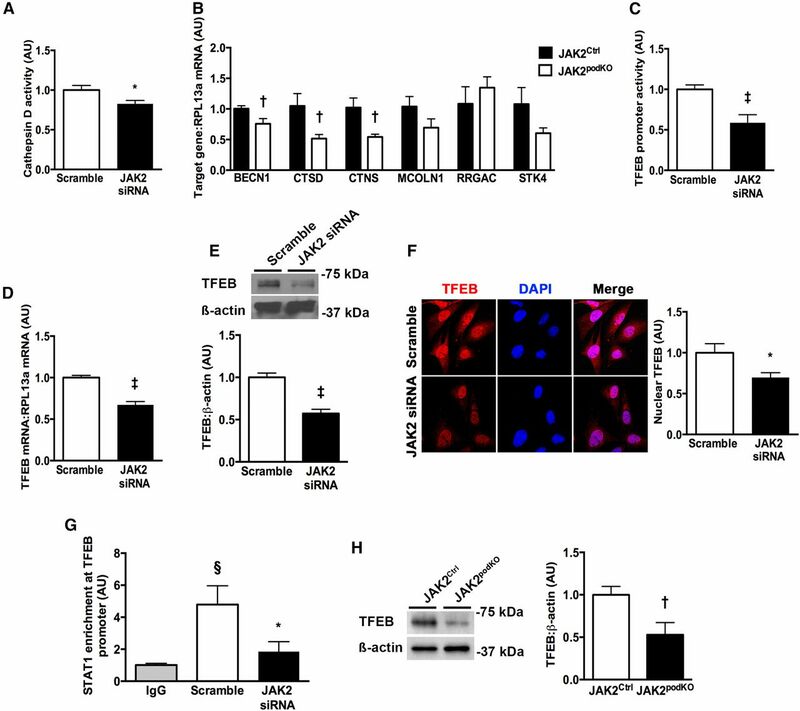 JAK/STAT signaling facilitates podocyte autophagy by promoting expression of the transcription factor TFEB that coordinates a network of genes that regulate autophagic-lysosomal function. Collectively, these findings (1) highlight the importance of JAK2-dependent autophagic processes to podocyte homeostasis, (2) uncover the significance of TFEB to the maintenance of podocyte function, and (3) show that TFEB is itself transcriptionally regulated by JAK2/STAT1 in podocytes. In this study, we examined the effects of knockout of JAK2 in podocytes of otherwise healthy mice and knockdown of JAK2 with siRNA in cultured podocytes under conditions of serum starvation. In each case, JAK2 deficiency resulted in an increase in autophagosome volume fraction and the accumulation of the autophagy cargo receptor of ubiquitinated proteins p62, which are together indicative of autophagy initiation but failed completion. Impairment in podocyte function was accompanied by an increase in urine albumin excretion in mice and an increase in albumin passage across podocyte monolayers. These findings are generally congruent with the previous descriptions of the phenotype of mice in which autophagy-related genes were selectively removed from podocytes1,35 and the phenotype of mice when the lysosomal protein cathepsin D was deleted.24 Whereas both basal autophagy and autophagy induction in response to nutrient deprivation are of use for cellular survival, under certain circumstances, autophagy can be detrimental, both initiating and executing cell death.36 To help us distinguish between cause and consequence, we elected to study JAK2podKO mice at a young, albeit adult, age (10 weeks). The largely unremarkable glomerular appearance under light microscopy at this age suggests that the impairment in autophagy completion with JAK2 knockdown was a de novo event and was not a response to generalized cellular injury. We considered two possibilities for the impairment of autophagy completion with JAK2 knockdown: (1) a block in the fusion of autophagosomes and lysosomes and (2) impairment in lysosome function itself. We found that few genes encoding proteins involved in autophagosome-lysosome fusion were altered in their expression with JAK2 knockdown and that those that were altered were all marginally increased in their expression. We speculate that this increase reflects a compensatory response to a downstream impediment. Reflective of lysosome enzymatic dysfunction, we found that JAK2 deficiency was accompanied by an increase in lysosome number, a decrease in the expression of lysosomal genes, and a reduction in the activity of the lysosomal aspartic proteinase, cathepsin D. We went on to discover that this dysfunction was due to the downregulation of the transcriptional regulator of lysosomal biogenesis and function, TFEB. TFEB is a member of the basic helix-loop-helix leucine-zipper family of transcription factors that was first identified as a regulator of coordinated lysosomal biogenesis and function in 2009.16 In its phosphorylated, inactive form, TFEB resides in the cytoplasm.34 On activation, it shuttles to the nucleus, where it binds to specific E-box sites at the promoters of several lysosomal genes that have been collectively termed the Coordinated Lysosomal Expression and Regulation gene network.16 Subsequent to the initial discovery of the role of TFEB in the coordinated regulation of lysosomal genes, it has now become apparent that the transcription factor also drives the expression of a network of autophagy-related genes.15,26 Although TFEB is known to be regulated post-translationally,34 this study also highlights the importance of its transcriptional regulation. Specifically, the JAK2-activated transcription factor STAT1 binds to the TFEB promoter, and knockdown of JAK2 decreases TFEB promoter activity, mRNA and protein levels, and nuclear localization. A functional role for TFEB downregulation in impaired autophagy completion with JAK2 knockdown is implied by the coincident downregulation in TFEB-regulated genes and a restoration of autophagic flux and podocyte permselectivity by TFEB overexpression. The autophagosomal-lysosomal clearance of accumulated proteins and damaged organelles is a complex process. One of the nuances of this complexity is its temporal regulation. As an illustration, the LC3-phosphatidylethanolamine conjugate, LC3-II, is recruited to autophagosomal membranes and degraded in the autolysosomal lumen during autophagy. In HeLa cells, TFEB overexpression caused an increase in LC3-II abundance, and siRNA-mediated knockdown of TFEB downregulated LC3-II.15 In podocytes, we similarly observed an increase in LC3-II with TFEB overexpression, and we observed an augmentation of this increase with the inhibitor of late-phase autophagy, bafilomycin A1, indicative of heightened autophagic flux. In contrast, downregulation of TFEB with JAK2 knockdown also caused LC3-II accumulation. This is likely to be a consequence of lysosomal dysfunction. Indeed, specific knockdown of the lysosomal enzyme and TFEB target cathepsin D was recently shown to lead to LC3-II accumulation in podocytes.24 In this respect, it is noteworthy that, whereas TFEB expression was decreased with JAK2 knockout/knockdown in podocytes, it was not abolished; also, TFEB-dependent autophagosomal-lysosomal genes were not uniformly reduced in their expression. Thus, with persistent, albeit reduced, TFEB expression, autophagy completion was impaired but was not negated, causing a phenotype characterized by the accumulation of autophagosomes and lysosomes and an increase in albuminuria without florid glomerular damage. The discovery that, under normal circumstances, JAK2 preserves podocyte functionality by promoting autophagy completion warrants consideration in the context of JAK/STAT pathway activation in human diabetic kidney disease5,6 and the preliminary benefits of the JAK1/2 inhibitor baricitinib in a 24-week, phase 2 study of participants with type 2 diabetes and kidney disease.7 Although the findings herein described would seem to sound a cautionary note as to the possibility of adverse renal effects of JAK2 inhibition, several distinctions should be considered. First, in an effort to unravel the normal actions of JAK2, we examined the effects of the kinase in one particular cell type (the podocyte), whereas systemic JAK inhibition affects multiple cell types, not even those limited to the kidney. Second, whereas we examined the consequences of JAK2 knockout/knockdown, baricitinib is an enzyme inhibitor and equally efficacious in blocking the activity of both JAK1 and JAK2 (IC50=5.9 and 5.7 nM, respectively).37 Third, although JAK2 functions in a homeostatic capacity in normal podocytes, the JAK/STAT signaling pathway also plays an important role in the development of inflammation,38 one of the principal drivers of the progression of diabetic kidney disease.39 Thus, the extent to which JAK inhibition may affect JAK2-regulated podocyte autophagy completion in patients and the extent to which these effects may temper the potentially renoprotective anti-inflammatory properties of JAK inhibitors remain to be determined. In summary, JAK2 functions in a homeostatic capacity in podocytes by facilitating autophagy. It does this by regulating the expression of the transcription factor TFEB that is necessary for normal autophagic-lysosomal function (Figure 5). These actions should be borne in mind in considering the long-term implications of therapies that interfere with the JAK/STAT signaling pathway. They also raise the intriguing possibility that therapeutically modulating TFEB activity40 may improve podocyte health in glomerular disease. JAK2 regulates autophagy completion in podocytes. (A) Under normal conditions (wild type), signaling through JAK2 induces translocation of STAT1 to the nucleus, where STAT1 binds to the promoter region of the gene encoding the transcription factor TFEB. TFEB, in turn, facilitates the transcription of genes involved in lysosome and autophagosome function, including cathepsin D. Autophagosomes are recognized by the presence of LC3-II and contain proteins bound to p62 and targeted for degradation. Autophagy completion involves the fusion of double-membrane–bound autophagosomes with lysosomes (recognized by the presence of LAMP2) and subsequent degradation of the contents of the resultant autolysosome. (B) When JAK2 is absent (JAK2podKO), TFEB expression is diminished, leading to decreased expression of lysosomal genes (including cathepsin D) and lysosomal dysfunction, impairing autophagy completion, and leading to podocyte dysfunction, diminished podocyte permselectivity, and consequent albuminuria. Podocin-cre+ mice [B6.Cg-Tg(NPHS2-cre)295Lbh/J]17 and R26Rfl/fl mice [B6;129S4-Gt(ROSA)26Sortm1Sor/J]18 were obtained from the Jackson Laboratory (Bar Harbor, ME). Jak2fl/fl mice were provided by Kay-Uwe Wagner (Nebraska Medical Center).19 Male JAK2Ctrl (n=10) and JAK2podKO mice (n=12) were studied at 10 weeks of age, and albuminuria was determined in an additional four mice per group at age 6 months old. Systolic BP was measured using a CODA Noninvasive BP System (Kent Scientific, Torrington, CA).41 Urine albumin excretion was determined by ELISA (Assaypro, St. Charles, MO) after housing mice individually in metabolic cages for 24 hours. After harvesting, mouse kidneys were immersed in 10% neutral buffered formalin, routinely processed, and embedded in paraffin; cryoembedded in Tissue-Tek optimum cutting temperature formulation compound (VWR International, Mississauga, ON, Canada) and stored at −80°C; or fixed in 2.5% gluteraldehyde for later analysis by transmission electron microscopy. All experimental procedures adhered to the guidelines of the Canadian Council on Animal Care and were approved by the St. Michael’s Hospital Animal Care Committee. X-gal staining of kidney cryosections was performed using an X-Gal Staining Kit (Oz Biosciences, San Diego, CA) according to the manufacturer’s instructions. Glomeruli were isolated from JAK2Ctrl and JAK2podKO mice using Dynabeads. After isoflurane anesthesia, the abdominal aorta was cannulated with a 24-gauge angiocath, and the mouse was perfused with 1×105 Dynabeads (ThermoFisher Scientific, Rockford, IL) in 5 ml HBSS (ThermoFisher Scientific). Podocytes were isolated using previously reported methods.42,43 Briefly, glomeruli were seeded on collagen 1–coated plates in a 1:1 mixture of F-12 Kaighn's Modification media (HyClone Laboratories, Logan, UT) with media harvested from NIH/3T3 cells (American Type Culture Collection, Manassas, VA). Cell cultures were maintained for approximately 4–6 days and were not passaged.44 For flow cytometry, cells were stained with antinephrin antibody (1:100; R&D Systems, Minneapolis, MN) and Alexa Fluor 488 donkey anti-goat antibody (1:100; ThermoFisher Scientific) before analysis using a Fortessa X-20 (BD Biosciences, San Jose, CA). Data analysis was with FlowJo software version 10.2 (FlowJo LLC, Ashland, OR). Immunoblotting was performed on cultured cell extracts with antibodies in the following concentrations: nephrin (1:1000; R&D Systems), JAK2 (1:1000; Cell Signaling Technology, Danvers, MA), α-tubulin (1:1000; Sigma-Aldrich, Oakville, ON, Canada), LC3 (1:1000; Cell Signaling Technology), p62 (1:1000; BD Biosciences), LAMP2 (1:1000; Abcam, Cambridge, MA), β-actin (1:10,000; Sigma-Aldrich), TFEB (1:500; Abcam), and GFP (1:1000; Santa Cruz Biotechnology, Dallas, TX). Densitometry was performed using ImageJ 1.46r software (National Institutes of Health, Bethesda, MD). Immunofluorescence microscopy was performed on formalin-fixed, paraffin-embedded kidney sections and cultured cells with antibodies in the following concentrations: JAK2 (1:50; Cell Signaling Technology), secondary antibody Alexa Fluor 488 donkey anti-rabbit (1:100; ThermoFisher Scientific), p62 (1:100; Cell Signaling Technology), secondary antibody Alexa Fluor 555 donkey anti-rabbit (1:100; ThermoFisher Scientific), LAMP2 (1:100; Abcam), secondary antibody Alexa Fluor 488 donkey anti-rat (1:100; ThermoFisher Scientific), TFEB (1:100; Abcam), nephrin (1:100; R&D Systems), and secondary antibody Alexa Fluor 647 donkey anti-goat (1:100; ThermoFisher Scientific). DAPI was from Cell Signaling Technology and used at a concentration of 1:10,000. Slides were visualized on a Zeiss LSM 700 confocal microscope (Carl Zeiss Canada, Toronto, ON, Canada). For p62, p62-positive puncta were counted in six glomeruli from six mice per group. For LAMP2, mean fluorescence intensity was determined in six glomeruli from six mice per group using ImageJ and represented as the fold change relative to control. In cultured cells, LAMP2 was calculated as the mean fluorescence intensity from four samples per condition, and nuclear TFEB was calculated as the proportion of positively immunostaining nuclear pixels (red) in five fields (×6300 magnification) from nine samples per condition using Adobe Photoshop 7.0 (San Jose, CA), with both represented as the fold change relative to control (scramble). Differentiated conditionally immortalized mouse podocytes were cultured as previously described.22 For knockdown of JAK2, cells were transfected with sequence-specific siRNA or scrambled siRNA (ThermoFisher Scientific) at a concentration of 75 nM for 24 hours. For experiments with EBSS, RPMI medium (Sigma-Aldrich) was replaced by EBSS (Sigma-Aldrich) 5 hours after the addition of siRNA (or scrambled siRNA), and cells were maintained for another 19 hours. Bafilomycin A1 (Sigma-Aldrich) was used at a concentration of 100 nM for 4 hours.31 TFEB overexpression was achieved by transfecting cells with a p-EGFP-N1-TFEB construct27 (gift from Shawn Ferguson; Addgene plasmid 38119; Addgene, Cambridge, MA) for 24 hours. Cathepsin D activity was determined with a commercial kit (Abcam). RNA was isolated from cell extracts using TRIzol Reagent (ThermoFisher Scientific), and cDNA was reverse transcribed from 1 μg RNA using SuperScript III Reverse Transcriptase (ThermoFisher Scientific). Primers were designed and validated using Primer-BLAST (http://www.ncbi.nlm.nih.gov/tools/primer-blast/), and they were synthesized by Integrated DNA Technologies (Coralville, IA). Primer sequences are shown in Supplemental Table 3. Measurement of gene expression was performed using SYBR green on a ViiA 7 Real-Time PCR System (ThermoFisher Scientific). For experiments in primary cells, mRNA levels were determined in podocytes from four JAK2Ctrl mice and four JAK2podKO mice. Experiments were performed in triplicate, and data analyses were conducted using the Applied Biosystems Comparative CT method. Podocytes were transfected with a luciferase reporter under the control of the TFEB promoter46 (gift from Albert La Spada; Addgene plasmid 66801; Addgene). Cells were transfected with JAK2 siRNA or scramble for 24 hours before determination of luciferase activity with a reporter assay system (Promega, Madison, MA). Chromatin immunoprecipitationwas performed using the Magna ChIP Kit (EMD Millipore, Etobicoke, ON, Canada). Briefly, mouse podocytes were transfected with scramble or JAK2 siRNA for 24 hours. After crosslinking and sonication, sheared chromatin was immunoprecipitated with an antibody directed against STAT1 (1:100; Cell Signaling Technology) or an equal concentration of normal rabbit IgG (Santa Cruz Biotechnology). Samples were then washed, reverse crosslinked, and proteinase K treated to obtain purified DNA fragments. Quantitative real-time PCR was performed using primers specific for a sequence of the mouse TFEB promoter (Supplemental Table 3). An albumin permeability assay was adapted from a previously described method.47 Mouse podocytes were grown to confluent monolayers on transwell plates and transfected with p-EGFP-N1-TFEB, JAK2 siRNA, or scramble for 24 hours. A tracer solution of 250 μg/ml FITC-albumin (Sigma-Aldrich) in RPMI medium was applied to the upper compartment, and the ratio of fluorescence of samples drawn from the lower compartment at 2 and 24 hours (excitation/emission wavelengths =495/520 nm) was determined using a SpectraMax M5 Microplate Reader (Molecular Devices, Sunnyvale, CA). Data are expressed as means±SEMs. Statistical significance was determined by one-way ANOVA with a Fisher least significant difference test for comparison of multiple groups and unpaired t test for comparison between two groups (or Mann–Whitney test for nonparametric data). Skew distributed data were log transformed before statistical comparison. Statistical analyses were performed using GraphPad Prism 6 for Mac OS X (GraphPad Software Inc., San Diego, CA). The authors thank Dr. M. Golam Kabir for his technical assistance and Kryski Biomedia for the artwork. These studies were supported by Canadian Institutes of Health Research Operating grant MOP-133631 (to A.A.). T.A.A. is supported by a King Abdullah Foreign Scholarship. S.M. is supported by a Canadian Diabetes Association Postdoctoral Fellowship. K.T. is supported by a Research Internship Abroad from the Sao Paulo Research Foundation (Fapesp 2016/04591-1). S.N.B. is supported by a Keenan Family Foundation Kidney Research Scientist Core Education and National Training Program (KRESCENT) Postdoctoral Fellowship and was supported by a Heart and Stroke/Richard Lewar Center of Excellence Fellowship Award and a Banting and Best Diabetes Centre Hugh Sellers Postdoctoral Fellowship. A.S.B. is supported by a Banting and Best Diabetes Centre-Novo Nordisk Studentship and was supported by a Queen Elizabeth II/Dr. Arnie Aberman Graduate Scholarship in Science and Technology and a Yow Kam-Yuen Graduate Scholarship in Diabetes Research from the Banting and Best Diabetes Centre. Portions of this work were presented in abstract form at the Annual Scientific Meeting of the American Society of Nephrology (Chicago, IL; November 15–20, 2016). This article contains supplemental material online at http://jasn.asnjournals.org/lookup/suppl/doi:10.1681/ASN.2016111208/-/DCSupplemental.